I’ll start by saying that I do not believe that it was Mariah. That being said……………….. I first checked out the Kodak Park area, but had no luck spotting any Falcons there. So it was time to head downtown. 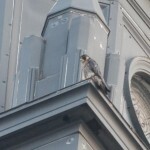 I found two Falcons on the north side of the old Changing Scene’s Restaurant (OCSR) at 10:30 am. I assumed that it was Archer and Beauty. 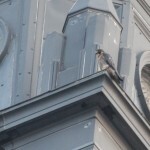 At 11:30 am, Beauty took off flying up to the nest box on the Times Square Bldg. Archer remained on the north side of OCSR. I parked over on the Broad St. Bridge, facing west, towards the Times Square Bldg. I had a nice view of Beauty sitting on the perch in front of the nest box. All was quiet. Until noon that is. At 12:00, Beauty took off, flying towards the east, over my head and continuing on towards the Bausch and Lomb Bldg. Archer was right behind her. Then I saw what got their attention. A 3rd Falcon had entered their air space and they weren’t happy. Ee-chupping filled the air as the three Falcons came together above me. There was some talon-tagging, but it didn’t last long. Almost immediately, Beauty broke off and returned to the nest box. Archer flew to the north west, and the 3rd Falcon continued off to the south west. Again all was quiet. My opinion is that this was a Peregrine migrating through the area and had no intention of attempting to take over Archer and Beauty’s territory. I don’t believe that it was Mariah. At 12:20, Archer joined Beauty in the nest box and I could see them bowing to each other. A couple minutes later, Archer flew out of the nest box and landed on the south side of the Wilder Bldg. At 12:30, Archer took off of the Wilder Bldg and flew around the building I was parked next to. I was not able to find where he went. At 2:00 pm, Joyce joined me and I left her to keep Watch. Beauty was still at the nest box. On my way home, I checked out the Kodak Tower and found a Red-tail Hawk sitting on top of the netting at the playpen level on the NW corner. That would never have happened if Mariah and Kaver were around. Lots of Watchers were out this weekend looking for Mariah, Archer and Beauty. I had no luck finding Mariah, but Archer and Beauty were hanging out near the Times Square nest box. I’ve put tother a KGallery album to share. The first few pictures are of Archer and Beauty from this morning (Sunday, 8/23). The rest of the pictures are of things I’ve seen over the past week. It was a really hot, humid day today, so Dan and I planned on getting out to Kodak Park early this morning to hopefully see Mariah or the unbanded Juvie. Dan and I were sitting on the street on the gorge side (east) of KP. At 7:15 am, Mariah flew in from the south, low over us and then up to the Research Lab Bldg. where she circled the building and landed on the antenna. For 45 minutes we were able to get really close looks at her through the scope. Her left leg was bandless, but I was unable to see the right leg to verify the blue/yellow band. I am 99.9% sure this was Mariah. It looked like Mariah. Kathy O joined me near the building and took a look through the scope. She agreed that it was Mariah. didn’t see her again after that. It was wonderful seeing her looking so well. She was beautiful in the early morning light. Needless to say, Dan, Kathy and I will be out again tomorrow morning. Afterwards, I picked up Brian H, and we drove around downtown. We found Archer on the Widows Peak building. No Beauty sightings. Falcon Watch North - KP - Adult Peregrine on the Hunt - 8/11/09 - 7:00 - 8:00 pm. Tonite, Lynda and I kept Watch on the west side of Kodak Park, with the sun behind us. It was a gorgeous evening. We kept a close eye on all the birds flying through the area. Pigeons, Gulls, Geese, Startlings, etc, etc. At 7:30 pm, Lynda told me that she saw a bird flying on the far side (east) of Kodak Park. The bird was flying over the gorge, circling higher and higher. It was definitely a Peregrine Falcon (good eye Lynda!) and it was definitely on a hunt. I’m fairly certain that it was an adult, but because the bird was so far from us, I never saw a split wing tip. For about 10 minutes we watched as the Peregrine circled above the river gorge. The Falcon then headed north, following the gorge. We waited for awhile to see if the Falcon would return. No such luck. Lynda was going to head downtown and I headed north down Lake Ave, towards the lake. I had hoped to find the Falcon, but again, no such luck. We’ll definitely be keeping an eye on this area. I hope to see Mariah and the unbanded juvenile again soon. Well, after a Mariah-less weekend (and believe me I tried! ), on my way into work today, I spotted a Falcon (which I believe was Mariah) up on the same antenna (Research Lab Bldg, Kodak Park) this morning at 6:40 am. I only had a moment before I had to be on my way. 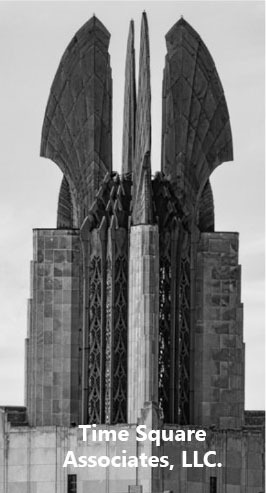 As I was taking a look at her in the beautiful morning sun, she spread her wings and stooped off of the building, low. She zipped around the building and headed in my direction, quickly veering off and heading low to the south. I never saw her come back up, but pigeons scattered everywhere! I wished her good hunting and went on my way. What a wonderful way to start my day! Saturday was a quiet day for peregrine falcons. Watchers Carol P and Brian were up at Kodak Park in the morning - no sighting of Mariah. I met Dawn, Carol P, Brian, Suzanne & Don (from Ithaca), & Jeannetta on the Pedestrian bridge by the gorge. It was hot in the sun, an no one had see any falcons. Around 4:00 pm, Carol P spotted a falcon flying around Old Changing Scenes (OCS). It was all quiet again, we all left the bridge and Dawn, Brian and I took Casey & Bullet for some doggie playtime at the fountain near HSBC. Brian and I headed back to Kodak Park, still no sign of Maraih. On my way home, I decided to check out Kodak Tower. From 8-9 pm, there sat Beauty on the NE corner of the launch pad. Back at the bridge I ran into Kristen, Scott & Nico out for a family watch with their scope. We saw Archer fly around the High Falls stack and try to land twice on the ladder that goes up the side. He reminded me of the juvies that would try to land there. Then Archer flew south, flapping all the way to OCS, and disappeared up the elevator shaft.